Fairy tales aren’t just for young children. They offer hope for a magical tomorrow, and isn’t that what every bride wants? A happily ever after, when she begins the new chapter of her life as a wife. The fascination for fairy tales, princesses, and Prince Charming never goes away for some women. If you are a bride, who has always been in love with fairy tales, you will definitely want a big fairy tale wedding to mark your union with your real-life Prince Charming. After all, you get married only once and you deserve to feel like a royal princess on this special day in your life. Planning the fairy tale wedding of your dreams isn’t too difficult when you have plenty of ideas to inspire you. Here are some magical fairy tale-inspired ideas for your royal wedding. Take a look and let us know what you will choose from them, for your wedding. 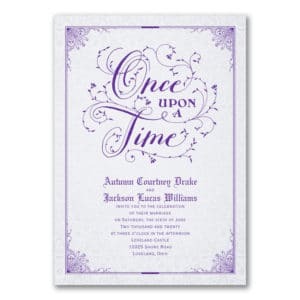 Give your wedding guests a sneak peek of what they can expect at your wedding with a lovely fairy tale theme invitation. Don’t you just love how this “Once upon a time” invitation card ties to the theme? Small details like the header for this invitation are all it takes to have your invitation reflect the style of your wedding. (You can order this invitation at this link.) If your wedding is inspired by any particular story, find an invitation with motifs or colors that are specifically linked to this tale. A royal wedding takes place at a castle, and you need the right setting to feel like a princess on your wedding day. 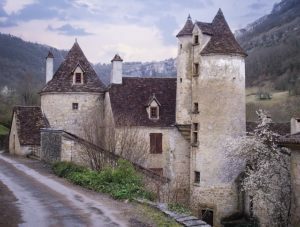 Whether you are in Europe, the USA, Canada or any other part of the world, there are no dearth of castle venues for you to pick from. 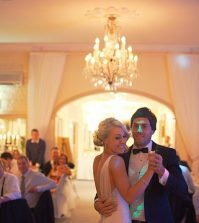 You can even find lists of suitable venues on the internet, like in this post on the Knot website. If booking a real castle is out of the question, you can create a similar scene by choosing a suitable venue and dressing it up with the opulent decor. Explore beautiful banquet rooms, hotels, stately mansions and resorts to find the right choice for your budget and theme. 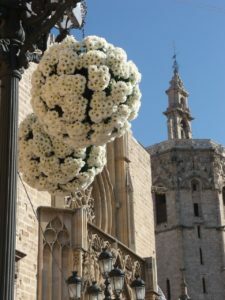 The perfect fairytale wedding will have elaborate floral decor. Fill your venue with plenty of flowers, and they will create the effect of grandeur, not to mention romance. Light pastel colors like pale pink, yellow and white will look stunning in such settings. You can also go with the theme colors of your fairy tale in your floral decor, to match it to the theme. So, golden yellow blooms for a Beauty and Beast wedding or vivid red roses for a Snow White theme wedding would be just perfect. Mix your floral decor with stunning crystal and glass accents for more impact. This is the perfect theme to go big on bling. 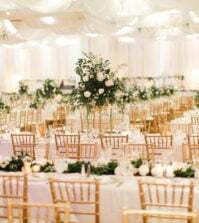 Whether it is your venue decor, table linen, party favors or even the dress and accessories, make a statement with lavish touches of gold, silver, and other metals. While gold creates an expensive and deluxe ambiance, silver and rose gold have the sophistication and romantic charm. Pair the metallic accents in your decor with saturated colors or neutrals to create a refined look. Sparkling shoes are an accessory that will make you feel like a princess in no time. Pick a pair of gorgeous heels that is sure to impress any princess. Don’t hesitate to choose one that is gold or silver, as this is the best opportunity to shine and dazzle to the most. As you dance the night away, the occasional peek of your dainty feet from beneath your gown will be very impressive with beautiful shoes adorning it. Or if your favorite fairy tale is Cinderella, find a glass slipper to play the part to perfection. Impress your guests with your attention to detail with small touches like beverage napkins and coasters that tie to the theme flawlessly. 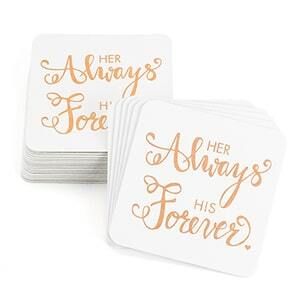 These white coasters with beautiful lettering in gold that is meaningful as well can instantly add a flourish to your table settings. 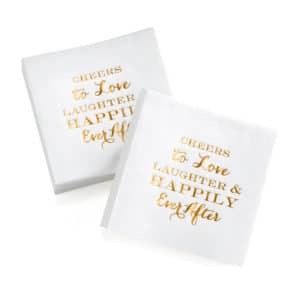 Similarly, take a look at these beverage napkins with the “happily ever after” that is just right for your chosen theme. The fact that the lettering is done in gold further enhances the effect of this essential table decor element. Princess-inspired hairstyles are anything but simple. Whether you choose an elaborate chignon or a dreamy intricately braided hairstyle, don’t forget to top it off with the perfect hair accessories. A flower crown will instantly enhance your look, while you can choose dainty hair bands, pins or combs for a touch of sparkle. If you really want to make a statement, you can even go with a royal tiara that will easily tie to this wedding theme. Remember that all fairy tale heroines have luscious locks. So, aim for that effect when you choose your wedding day hairstyle. The wedding cake gives you plenty of opportunities to use your creativity and find different elements that match the theme. Either aim for simple elegance with naturally colored elements like flowers, fresh fruits, and berries or go for classic sophistication with a magnificent sculpture. Beautiful accents like sugary pearls, frosted roses, bows, and ribbons are all ways to create an opulent effect. 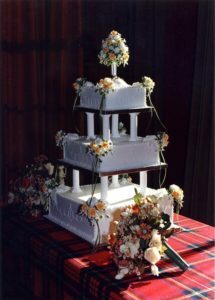 Play up the theme to the maximum with a big cake with plenty of interesting tiers. Also, choose flavors that are classic and luscious for a beautiful effect. How you arrive at your wedding will receive a lot of attention from your guests. 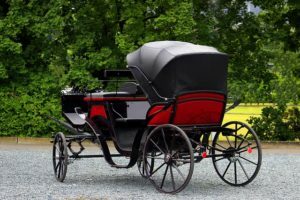 So, make a worthy entrance in a horse-drawn carriage, and it will be grand and memorable. It will also be a grand experience for you. Opt for a vintage-style carriage and it will suit the theme perfectly. Also, make sure your charioteer is in full costume, and that the chariot is decorated with flowers and ribbons to complete the effect. For more interesting and unusual ideas for wedding vehicles for all different themes, take a look at this post on the Hitched UK website. Twinkling, little lights will instantly transform any venue. Pretty lanterns are also beautiful decor elements. They will enhance the beauty of your venue and tie to the fairy tale theme. Another benefit of this item is that it is suitable for both indoor and outdoor venues. Whether you choose a woodland theme or a royal castle theme, soft lighting in the location of your choice will transform the space and help you achieve a beautiful effect. Little girls will love your fairy tale theme just as much as you do. So, why not give them a role to play in your wedding and remember the experience even more fondly. 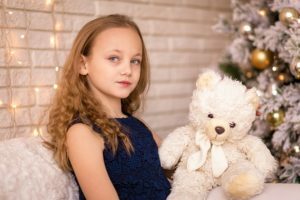 Have your flower girls in pretty princess dresses or lace frocks, and add cute flower crowns or tiaras to their outfit. Dressed in pretty layers of tulle, they will look like fairies right out of your storybook. Not to mention how much they will enjoy the role. You will be their favorite real-life princess and they will be a delightful addition to your wedding scene. Add an enchanting touch to your reception space with dramatic mood lighting with different colors that wash over the room. Place your light sources strategically, so they enhance the effect of the decor pieces and bounce off sparkling tablescapes. 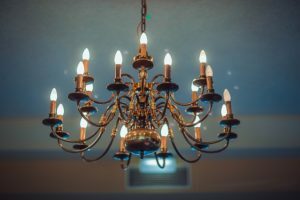 Chandeliers and other crystal accents will also help your venue look opulent and magical. You can consider using images of the moon and stars in your backdrop to create a beautiful effect. 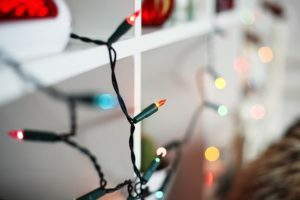 For a real fantasy effect, hang lanterns from the ceiling with thin strings so it looks like it is floating in thin air. No wedding is complete without the perfect wedding dress for the bride. With the entire wedding being a picture of opulence and festivity, your wedding dress should also fit the scene. Choose a dress with statement features that make it fit for a princess. Here are some dresses to consider from our collection at Best for Bride. Spectacular lace appliques spread throughout the fitted bodice and scatter into the skirt of this lovely Mori Lee wedding gown. 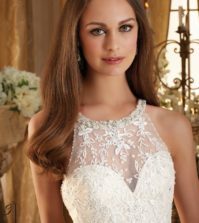 The delightful scalloped lace neckline and cap sleeves, as well as the breathtaking illusion details in the back of the dress, will stun your guests. Don’t forget that the dress also features a stunning train. This will add the perfect finishing touches to the beautiful tulle skirt. Strike the right balance between drama and poise with this stunning dress from the Mori Lee Collection. The strapless neckline with a delicate sweetheart detail continues into a snug-fitting bodice with plenty of intricate embellishments. The skirt of this dress enchants with its several layers of ruffles that cascade to floor length in beautiful waves. The flounced skirt ends in a fabulous train that adds a regal effect to the overall design. Simple in its details, but exquisite in effect, this Sans Pareil ball gown is the picture of elegance. Smooth satin forms the entire structure of this unblemished beauty. It has an off-the-shoulder embellished neckline and a beautiful chevron band at the waist. The neatly pleated skirt enhances the pristine white of the dress, and it has a breathtakingly beautiful chapel length train. With few other embellishments, the dress will work with almost any choice of accessory. The perfect dress for a fairy tale princess, this beautiful ball gown from the Sans Pareil collection has shoulder straps formed of intricately woven lace appliques. The sheer neckline stretches from shoulder to shoulder, and the satin waistband also has lace appliques enhancing its beauty. The delicate softly pleated skirt flows to full length. The back features a beautiful corset detail and train, with the silky satin that forms a bow. Here is a classic gown that is trendy at the same time. This Sans Pareil ball gown is a majestic piece with its crystal studded bodice and sweetheart neckline. 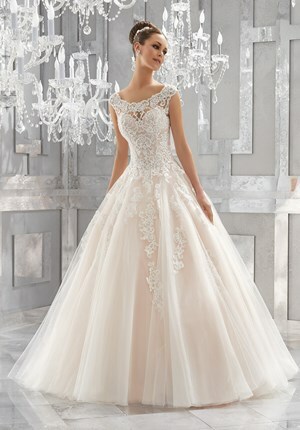 It also has a voluminous skirt with three-dimensional floral appliques closer to the hemline. The 3-dimensional details also include butterflies and other beautiful nature motifs that add to the charm of this exquisite dress. The entire train of the dress is also embellished in the same fashion. So the dress is a beauty from every angle. Full-length lace sleeves over a strapless bodice and a beautifully gathered misty tulle skirt makes this dress an amazing princess gown. Not only is the neckline romantic, the scintillating effect of the shimmering lace layer over the bodice spills into the waistline. The hemline is accented with lace motifs that continues into the court train. The volume of the skirt is equally bewitching. The dazzling all-over details make a dress a grand piece by itself. A tiara is all that you need to complete your bridal look. Carrying off a fairy tale wedding involves a lot of planning and detail. Nevertheless, it is a wonderful theme that will be loved by all your guests. So, don’t hesitate to give it a try. And for the perfect dress to be that royal princess at your fairytale wedding, look no further than in our bridal dress collection. Click here to be directed to our bridal gallery, and make your pick from the choicest princess gowns there is. The fairy tale wedding I am thinking of did not include a castle, but I can see where that would be desirable. Great tips! Personally, I want a lot of flowers. Many different colors and smells so that as you walk around the event, you get those different scents throughout. I attended a wedding that had a horse drawn carriage and I thought that was pretty cool! The fairy tale wedding invites is pretty neat as well! When the shoes POP you really get some attention, however, most of the wedding dresses that I look at are quite long and would hide the shoe any ways. I agree. I the photos especially. 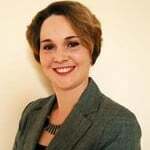 They will stand out, but they might also take away from the main subject of the image, YOU! Fairy tale weddings has to be the number one thing that is dream about by little girls. ALL of these things included. The castles, the flowers and of course all of the bling! I wish I could afford a wedding that would include a castle and all of the things you mention here. Is there a way you can have a fairy tale wedding without having to speed thousands of dollars? Right! Fairy tale is right! It would be totally epic to have a wedding in a castle, but that is not a reality for most people. Thank you for your information on this website. It has become very helpful for me to help plan my wedding. These suggestions might be out of my price range, but they did offer me some good ideas.